What Is a Sump Pump and Why Might I Need One? A sump pump removes accumulated water from basements or low points in a building. Sump pumps have two basic components: a reservoir to collect unwanted water (usually a pit or basin cut into the basement floor) and a pump that discharges the accumulated water away from the building’s foundation. Sump pumps are strongly recommended for any dwelling that is at risk for regular flooding, is perpetually damp, or where the foundation is below the level of the water table. What Kind of Sump Pumps are Available? A pedestal pump has a motor that is mounted above the sump basin. Pedestal pumps are relatively easy to install and maintain, and will last about 25-30 years, but are more conspicuous and more prone to clog with accumulated debris. A submersible pump is mounted inside the sump basin and sealed to prevent short circuits. It will last about 15 years and is more expensive, on average, but it is also less conspicuous and less prone to clog up. When the accumulated water in the basin reaches a critical level, a float valve on the pump activates the system to flush the water out of the pit and to another location away from the building. Where Does Water from the Sump Basin Go? In most communities, condensate, sump and downspouts are not allowed to be connected to the sanitary sewer. Your county or municipality charges sewer fees based on the water that enters your house through a metered line. Discharge from your sump pump is not metered and puts additional load on the sewer system and water treatment facilities, so building codes require that the discharge line be connected to a storm sewer. If no storm sewer is located close by, the discharge pipe must empty into a drainage swale, ditch or stream that will carry the water away from your house without creating water problems for your neighbors. In some older homes with existing sump pump systems, water may still discharge into sanitary sewers, although municipalities increasingly urge homeowners to reroute their discharge to a storm drain or other approved site. Your service technician will assess your basement’s waterproofing systems, including perimeter drains, to ensure that unwanted water is properly diverted to the sump pump’s collection basin. He will excavate a section of your basement (or crawl space) floor for the sump pit, usually about eight inches from a foundation wall, and will also punch a hole through a rim joist to accommodate the system’s discharge pipe. Your plumber will then route the discharge to an acceptable location at least 10 feet away from your foundation. Most sump pumps are hardwired into your home’s electrical system. However, some pumps use your home’s pressurized water supply as a power source. A sump basin that is not consistently pumped may overflow. To ensure that your sump pump continues to operate during power outages, your service technician will recommend including a battery backup system with the new installation. He is also available to add this important feature to existing sump pump installations. 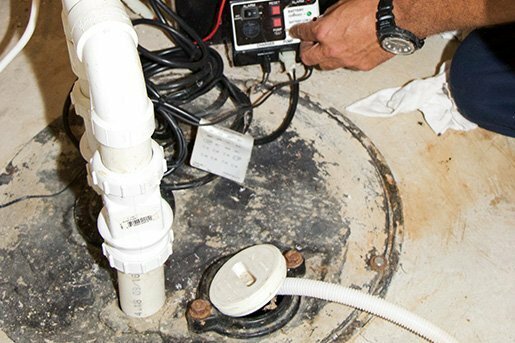 A properly installed sump pump is generally reliable if regularly tested and maintained. Your plumber can periodically test your pump and backup system and make any necessary repairs or adjustments, including clearing away accumulated debris and other blockages. You should also regularly test your sump pump yourself, by adding water to the sump basin to trigger the pump. A sump pump system can be a critical part of ensuring the safety and comfort of your home. If your basement is always damp or has recurring flooding issues, if your current sump pump is unreliable, or its discharge target does not meet your community’s current codes, or if you want to add a battery backup system, consult your plumbing professional.